It remains a popular myth that TV is the one medium Frank Sinatra couldn’t conquer. The conceit stems from his two attempts at weekly series, first in the early 1950s when his popularity had sunk to a dismal low, and again in 1957 when, though Sinatra was at the peak of his comeback wattage, a misconceived mish-mash of drama, comedy and music failed to ignite viewers. 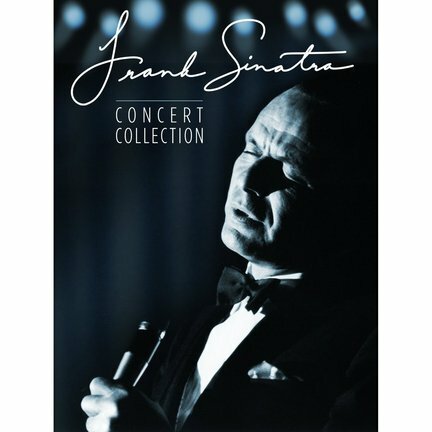 But in 1965, NBC had the wisdom to present Sinatra precisely the way the public wanted: alone on stage, backed by a first-class orchestra, performing hit after hit in cool, easy-swingin’ style. The result was A Man and His Music, a minimalist triumph that set the framework for annual specials through 1969. Guests were occasionally featured – Ella Fitzgerald and Antonio Carlos Jobim in ’67; a less-impressive Fifth Dimension in ’69 – but the primary focus remained Sinatra + classic arrangements of his best-loved songs. After his brief retirement, Sinatra returned to the airwaves in ’73, trim, relaxed and in superb voice for the excellent Ol’ Blue Eyes Is Back with Gene Kelly, followed in ’74 by the overblown but compelling Sinatra: The Main Event from Madison Square Garden. 1977’s Sinatra and Friends, built around awkward pairings with the likes of Loretta Lynn, John Denver and Robert Merrill, was a preposterous blunder. His final U.S. special, 1981’s Sinatra: The Man and His Music wisely reverted to the solo concert paradigm.